Enzymes provide enormous rate acceleration and exquisite specificity. A basic unanswered question in biology is: How do enzymes work? While significant progress has been made in the study of enzyme action, many of the most basic questions remain unanswered. We still cannot quantitatively account for the enormous rate enhancement provided by any enzyme. The now standard tool of site-directed mutagenesis has been central to the study of enzyme mechanism and has offered a powerful approach to identify residues important for catalysis. Nevertheless, the limited chemical diversity of the naturally occurring amino acids precludes the systematic and incisive variation of atomic or molecular properties necessary for the next generation of mechanistic enzymology and an in-depth and quantitative dissection of enzyme function. To overcome these barriers, we are using unnatural amino acids and protein semi-synthesis to systematically and rationally vary the properties of residues within enzyme active sites, and will generate the unnaturally substituted variants in the multi-milligram quantities needed for kinetic, thermodynamic, structural, and spectroscopic studies. Atomic level mutagenesis to investigate enzyme mechanism at a new depth. A) Site-directed mutagenesis ablates or replaces functional groups. 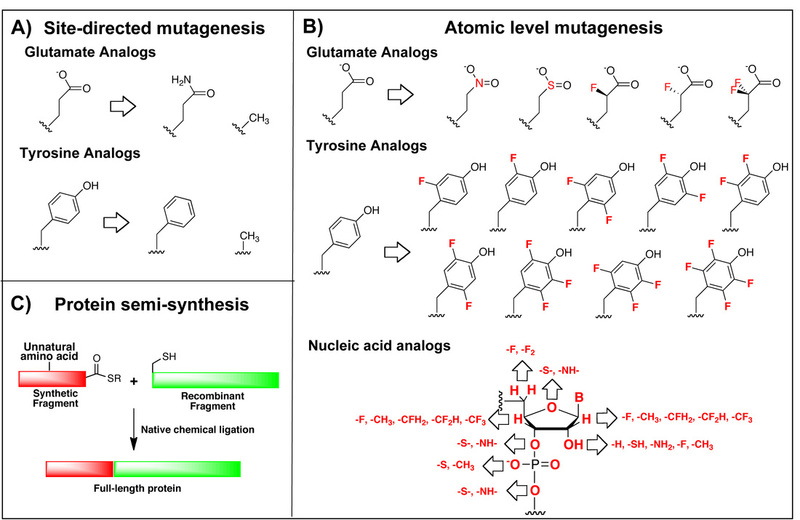 B) Atomic level mutagenesis systematically varies functional groups. Modifications are colored red. Only glutamate and tyrosine are shown as examples, and the nucleobases are omitted for clarity. Essentially every atom in a nucleic acid can be modified. C) In protein semi-synthesis a fragment bearing the unnatural amino acid is generated via solid phase peptide synthesis (red) is ligated to a recombinantly generated fragment (green). 1) How does general acid/base catalysis contribute to enzymatic rate enhancement when enzymes use the same chemical groups as small molecule catalysis? 2) What are the features that distinguish reaction on an enzyme relative to water in a solvent exposed active site? 3) How do interconnected catalytic strategies contribute to the enormous rate enhancement provided by enzymes?